Training is an integral part of a healthy lifestyle that doesn’t come without proper instruction and commitment. Being healthy isn’t so much of a personal decision as it is a responsibility you have to your family, your friends, and most importantly to yourself! I believe in a combination of properly performed strength and cardiovascular training in conjunction with a healthy diet. Achieving better health does not necessarily mean cutting out the foods and activities that you love, but rather balancing the poor habits with the good to achieve a higher level of well-being. Being healthy is one of the more vital parts of life, as is being happy. Therefore, the goal should be to find enjoyment and balance in the pursuit of better health! Andrew holds an Advanced Diploma in Public Safety with an Investigations Major from Melbourne, Australia. He met his American wife on a remote beach in Southern Thailand, and we are so glad that he landed in Kansas City and came to work at City Gym. 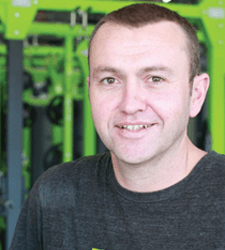 Andrew has been in the fitness industry for over three years and his favorite aspect of Personal Training is seeing his clients achieve goals and feel excited about the changes in their bodies. In Andrew’s free time, he enjoys cooking, traveling, and spending time with his wife and son.